Can you confirm these amateur observations of Oligodon cinereus? Type locality. “Gamboja”, now Cambodia. Types Holotype: BMNH RR 1946.1.1.25 (adult male). Comment Distribution: Not listed by GRANDISON 1977 for West Malaysia or Singapore. O. cinereus was reported from Borneo by DE ROOIJ (1917) under the name O. violaceus, but does not occur on Borneo according to MALKMUS et al. (2002). 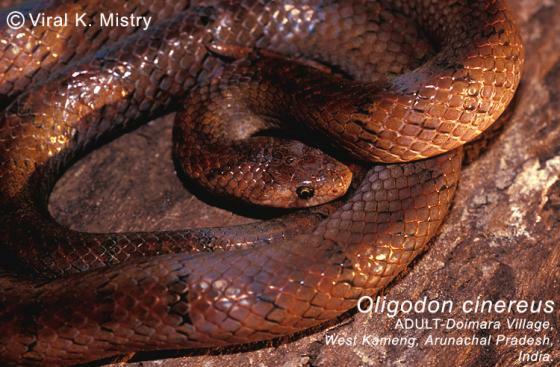 Specimens from Thailand identified as Oligodon cinereus multifasciatus and Oligodon cinereus swinhonis (Günther, 1864) are referred to Oligodon joynsoni (Smith, 1917) according to DAVID et al. 2011. Possibly in Bhutan (Lenz 2012). Subspecies: A morphologically variable species, Oligodon cinereus shows a variety of dorsal patterns (see Smith 1943), which have been used as a basis for describing several subspecies. However, the current intraspecific taxonomy of this species remains unresolved. Wagner (1975) showed in his unpublished MSc thesis that the differences between the various subspecies were unclear. Wagner refrained from accepting subspecies, a position that was followed by DAVID et al. 2011. O. cinereus is really several species (O. cinereus Günther (including O. (including S. v. plurimaculatus Bourret) [F. WAGNER, pers. comm.]. The original description is available online (see link below). Etymology Named after its color, Latin “cinis, cineris” = ash.